Balinese cooking is like none other in the world, steeped in tradition and using spices and fresh ingredients that are exotic and like none other in the world. Come get your foodie on with these great cooking classes, each offering an introduction to the rituals and mythology accompanying the delicious culinary preparations. The Casa Luna Cooking School classes provide a fascinating insight into Balinese life, beliefs, and culture through learning about its food, cooking, and culinary myths. Class discussions are relaxed and friendly and are held in the elegant grounds of the Second Honeymoon Guesthouse in Ubud. 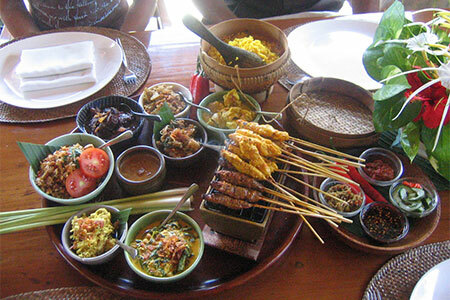 They include specific references to the role of food in Balinese society including its ceremonial use and religious importance. Participants learn about the exotic herbs and spices used in ceremonial and everyday Balinese dishes and are encouraged to actively help prepare the lavish Balinese feast that will then be enjoyed with a glass or two of the local rice wine or homemade hibiscus tea. This class is taught in the small village of Amed. Anis, the owner of Cafe Harmony, begins the class with an introduction to the many spices, herbs, and vegetables she grows right in her own garden behind her restaurant. Begin with the basics of making sambal, the main table condiment in Bali, and wrap up with fresh fish. This class is an experience not to be missed. Guests participate in the preparation of the foods and then enjoy a beautiful lunch set out in the open-air restaurant.